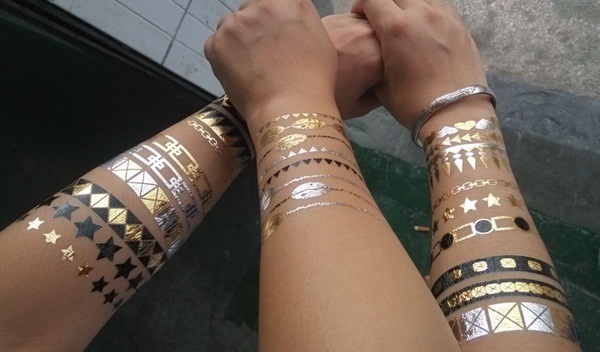 Today body art in the form of tattoos has increased with desire and design thanks to the use of Metallic Tattoos. The gorgeous way that the tattoos make the wearer feel is just a sign of how the new “gen” likes to enjoy beauty and comfort. 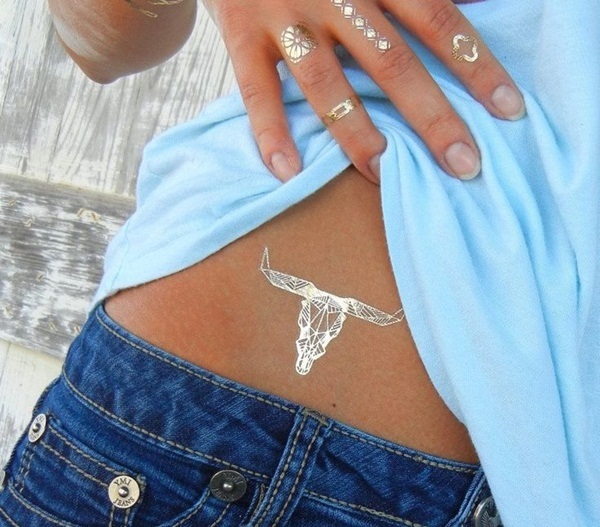 This is the type of tattoo that young ladies and men enjoy wearing anywhere proudly displaying their bodies with Metallic Tattoos. 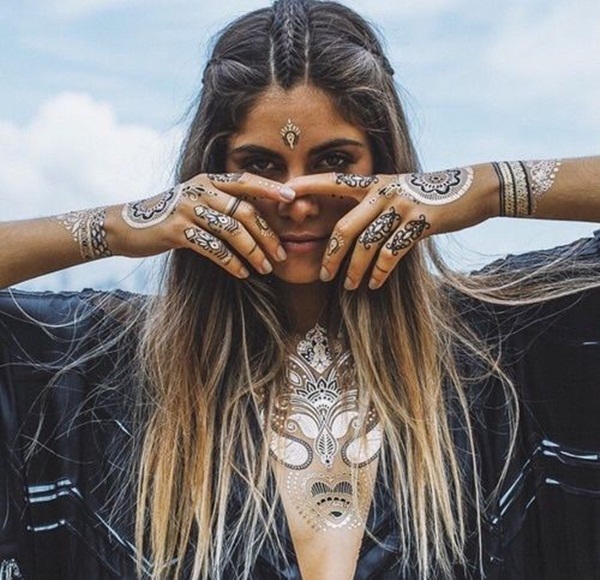 The designs from ancient India to modern day American are all uniquely placed on the body. 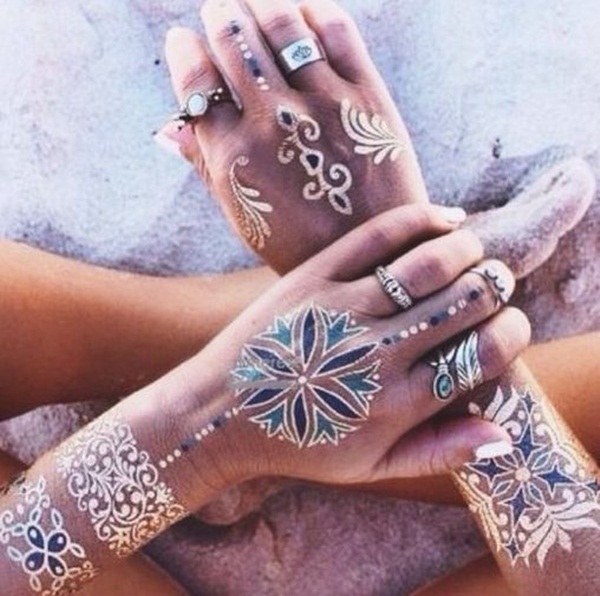 The artists are proud of their work because they know that the person who wears them are just as proud to display the Metallic Tatoo. 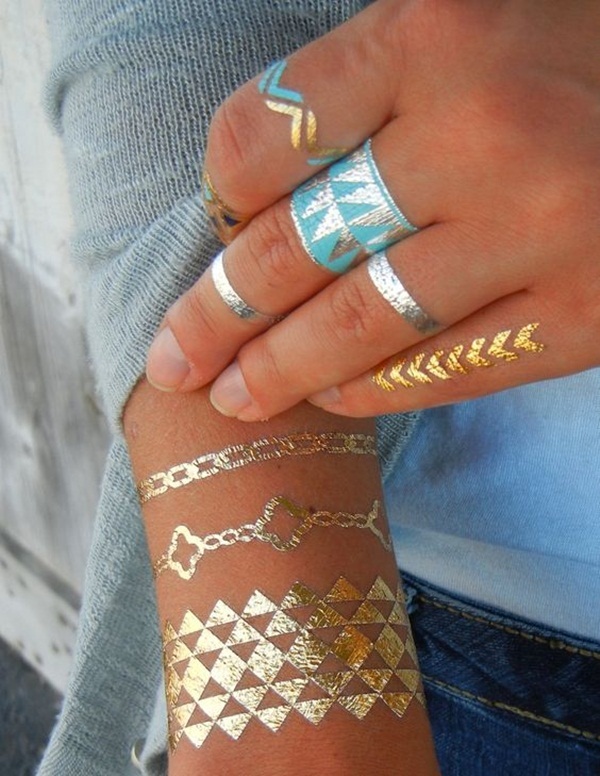 Beautiful Gold and Silver Metallic Tattoos that are in diamond and triangle shape. 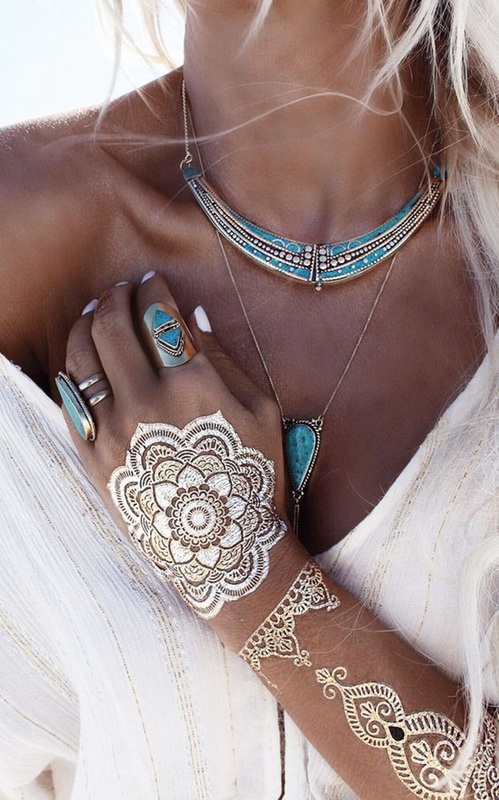 Don’t forget the stunning gold chain that accents this beautiful jewelry piece. 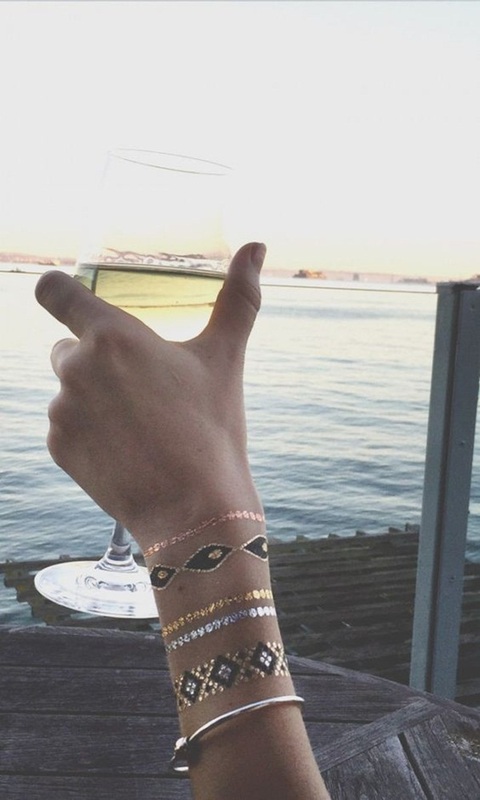 Bracelets that are charming but give off the “native” look in you. Done in swirls, arrows, and circles. Enhanced with the Pineapple on the wrist. 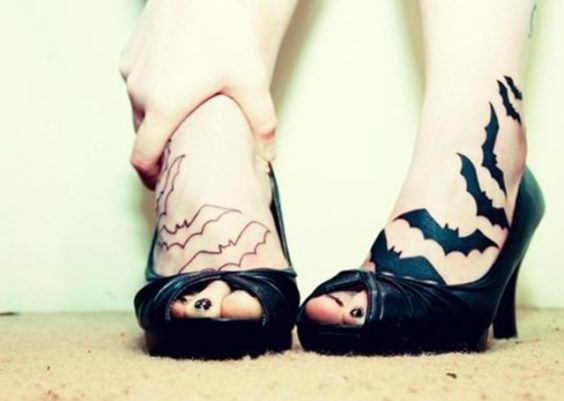 What a gorgeous Tattoo. 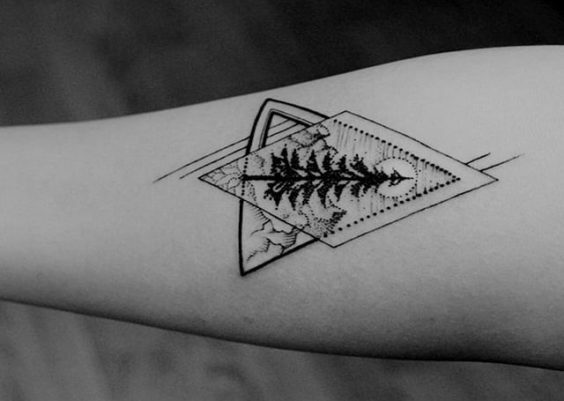 This gorgeous Tattoo shows off the triangles and arrows on the legs and arms. 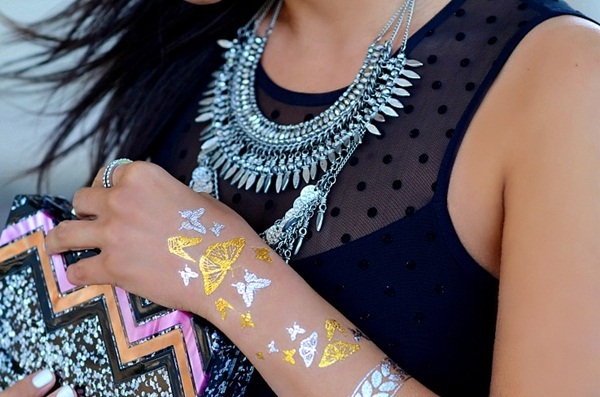 Fantastic motif that makes a great Metallic Tattoo. Know how to go wherever you stand. 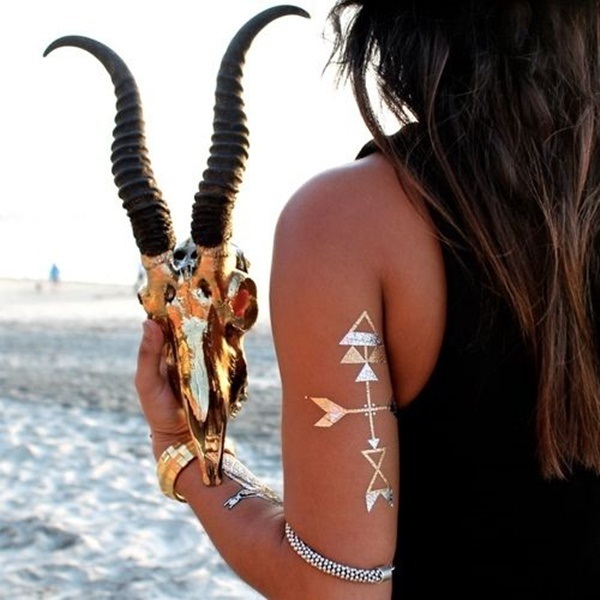 This beautiful weather vane Tattoo is done in both Gold and Silver placed on the back of the arm. 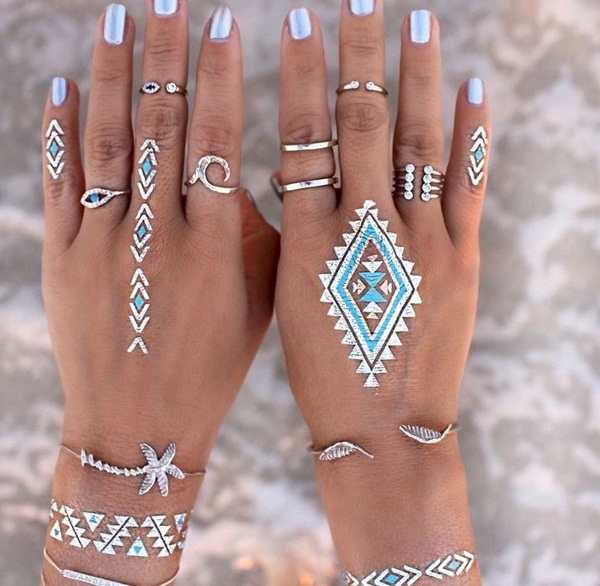 All the curves and triangles with other points to make a blue and white tattoo. 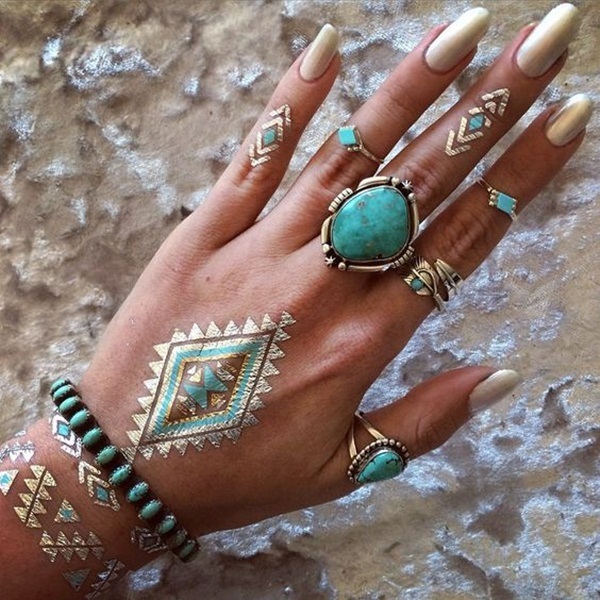 Feel the ancients in this gorgeous tattoo. 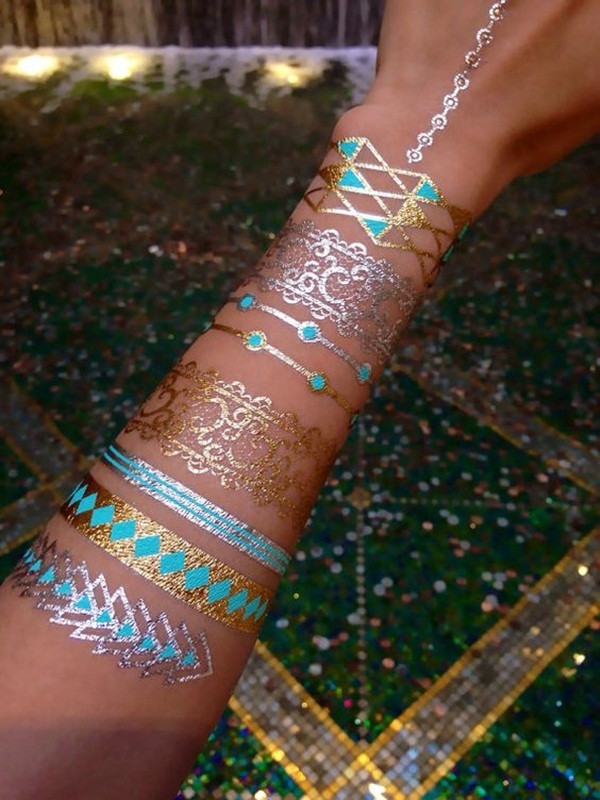 This is a very lovely Metallic Tattoo depicting many of the customs of India. See the maze of Gold on the back and leg. 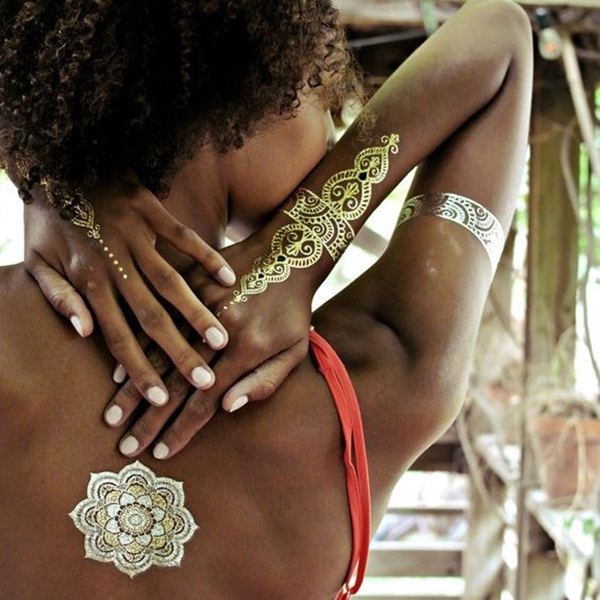 This Golden Girl has a whole story written in Gold Tattoo. 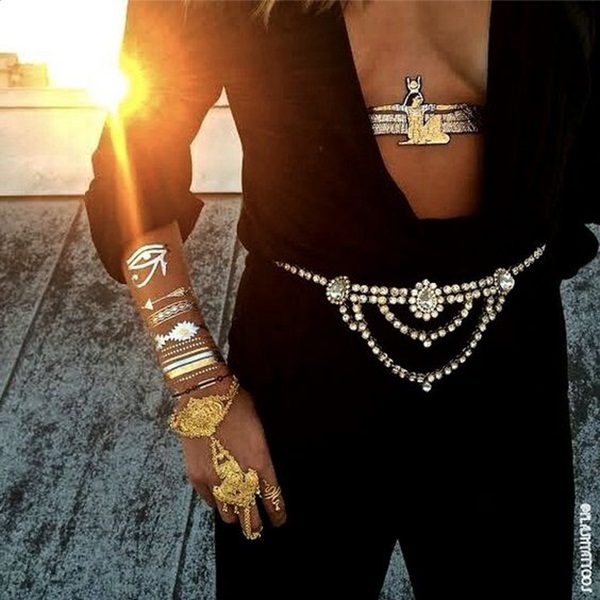 Placed high on the thigh to reveal the Ancients design this golden Metallic Tattoo is beautiful and the bracelet on the arm helps to add to the beauty of the leg. 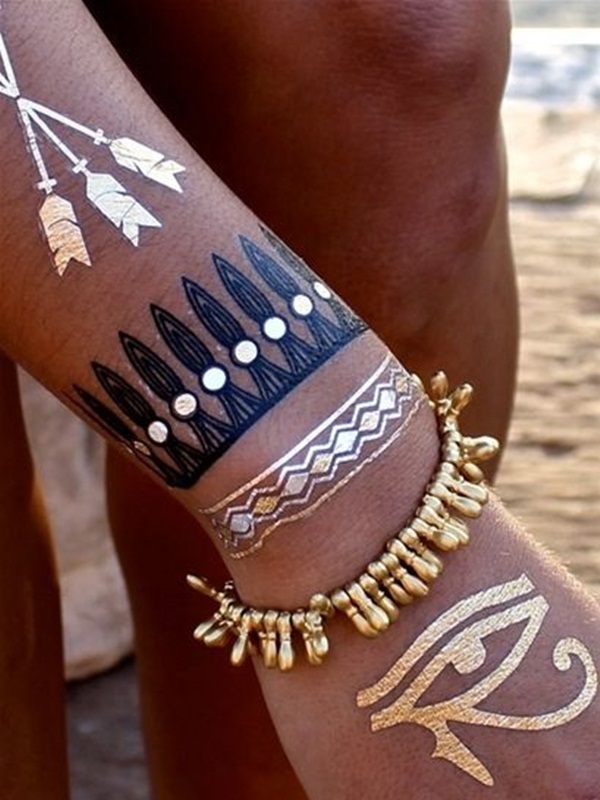 This is a very beautiful Tattoo done in white and gold with arrows and triangles. 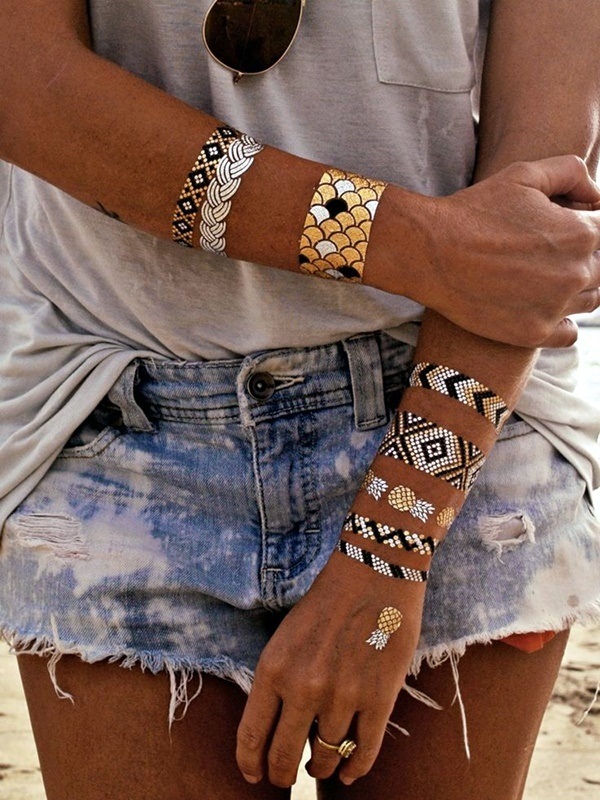 Metallic Tattoos in Gold and White that show leaf designs and fish design capture the heart of the tattoo wearer. The Bull done so magnificently in white then touch off the fingers with inlaid Metallic designs. Beauty in Blue Persian with a touch of the sea. 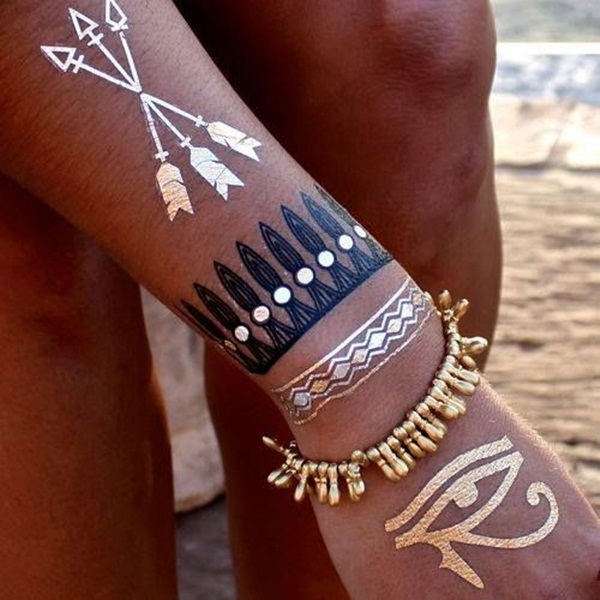 Visit the land of Egypt on your arm with these beautifully designed tattoos. A bit of the ancient world done in gold brocade. 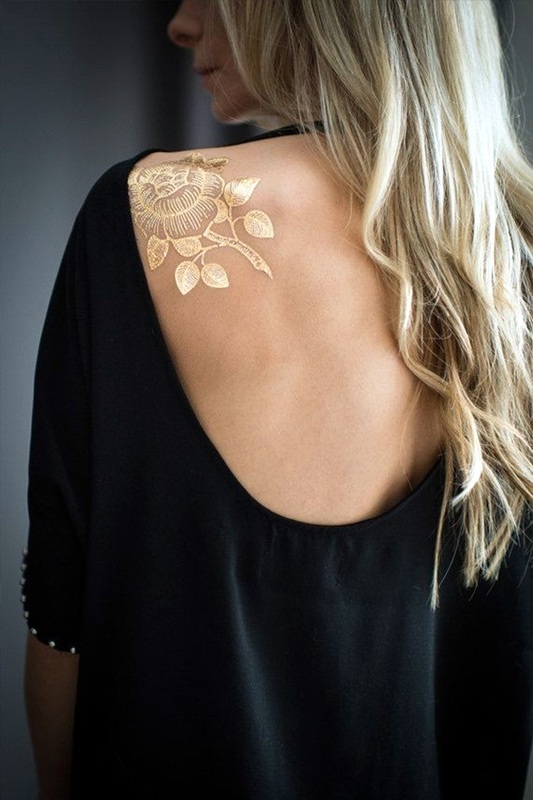 This is a beautiful accented Tattoo that will light up your back. 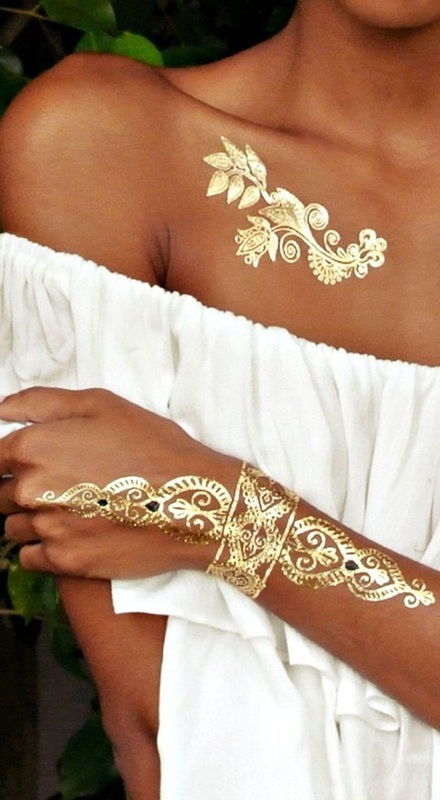 The Golden Metallic Tattoo goes straight down the spine of the back. 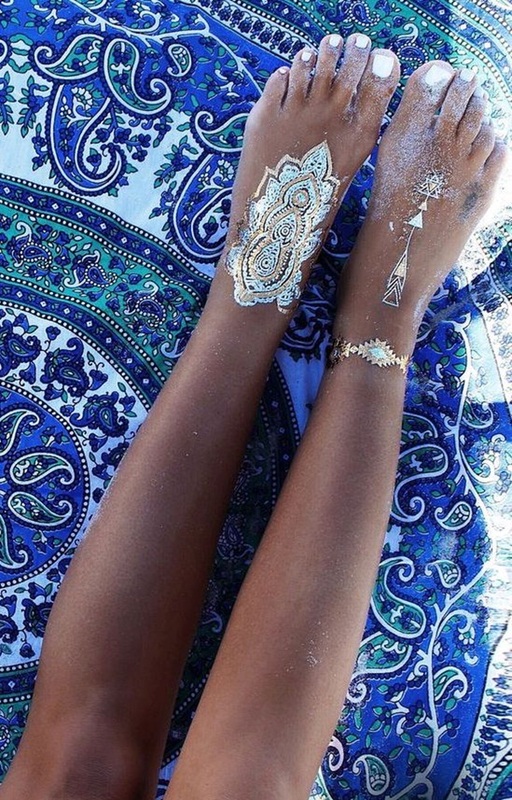 Done in Gold and Silver to add beauty to that foot. Done in White and Gold gives this lady the look of eloquence. Designed perfectly on the arm with just a touch of black eyes on the side. 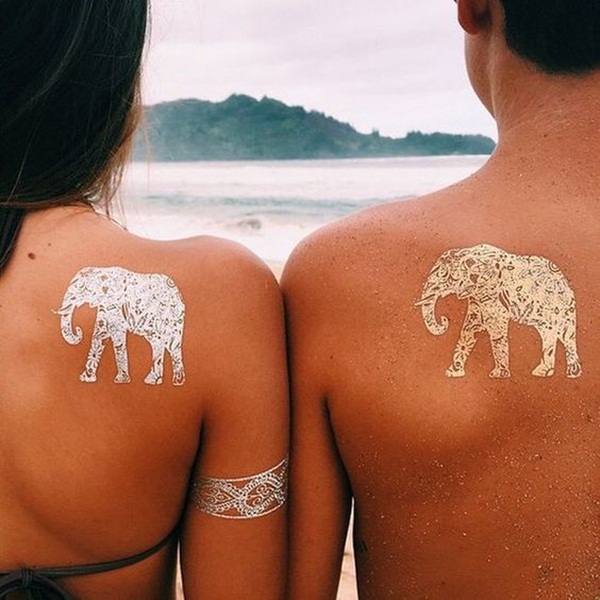 See the heart shapes and the circle of life on her back. 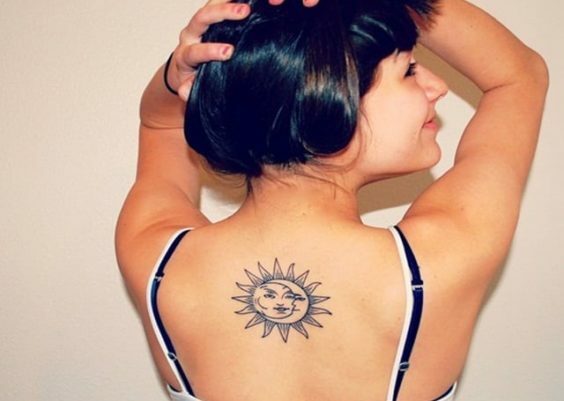 This is a tattoo you will want to conquer today. 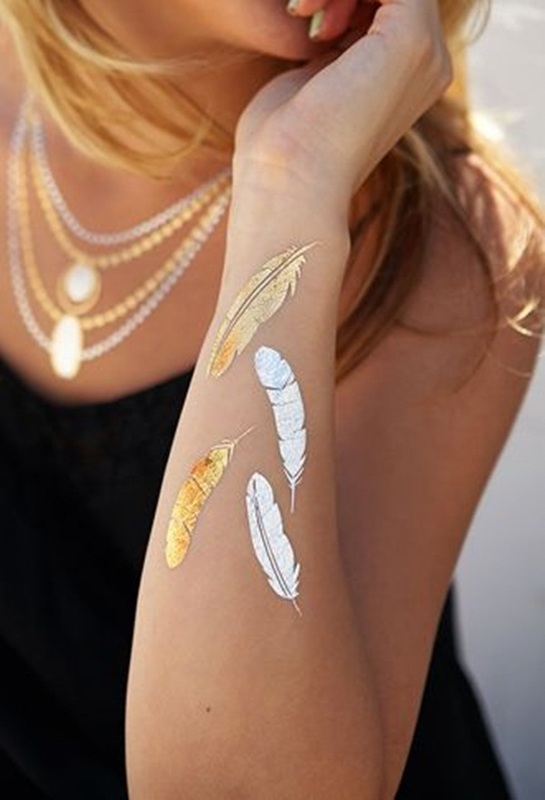 This gorgeous Metallic designer Tattoo is set with the Phoenix and other brocade designs of arrows and hearts. Giving the natural native look. 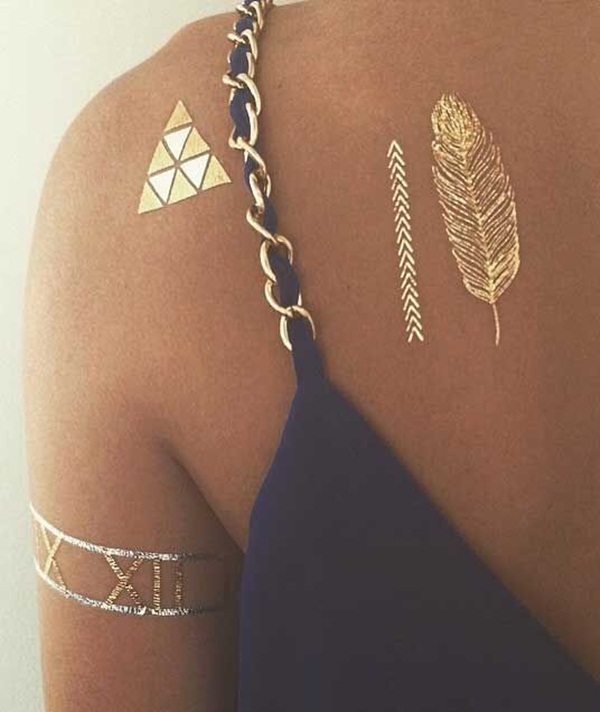 Find beauty in arrows circles, and more with this classical golden Tattoo. The precious designs shows beauty and class done in gold, silver, and black. How exquisite a arm bracelet in Roman Numbers with feathers, arrows and triangles accented just above on her back. 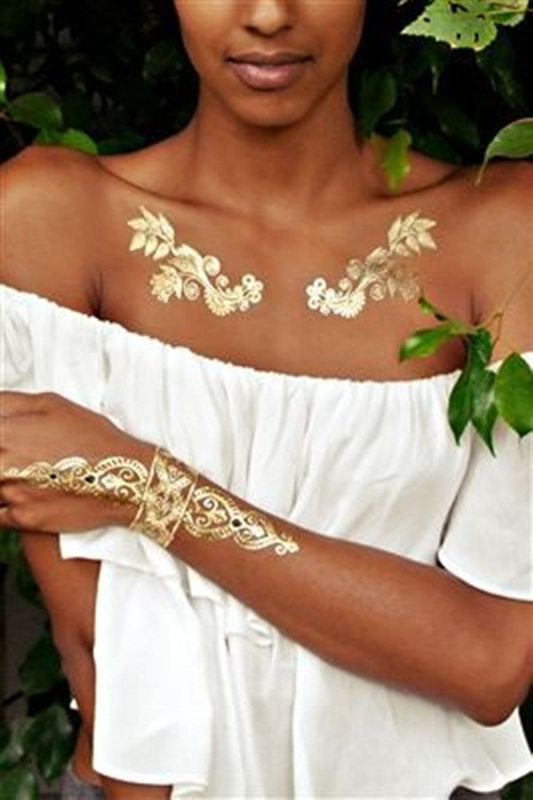 Cascading down her back with beautiful leaf design on her arm. See the Palm Tree’s and Ocean Waves with Metallic dust that is for you. All designed perfectly to give a woman the feel of magic. 42. 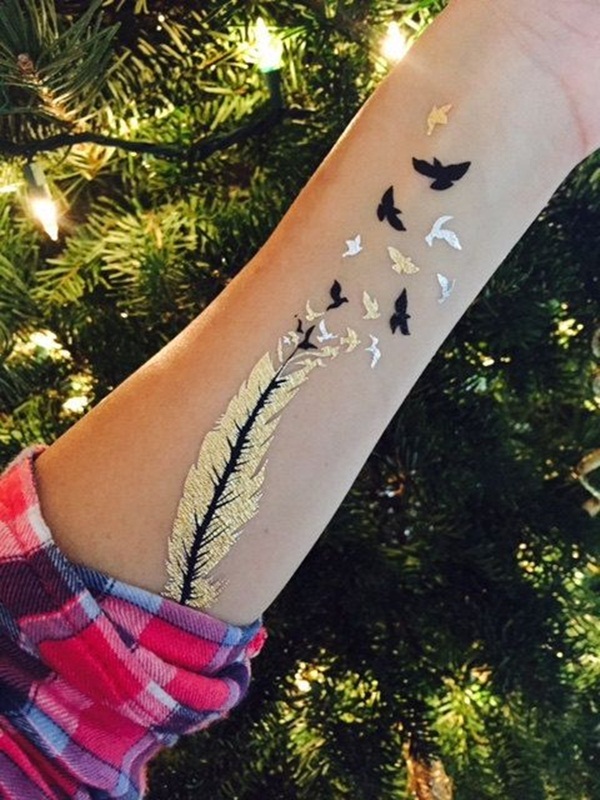 Falling Metallic Feathers whispers the seasons well placed on the elbow. The back is made glamorous with the full array of the magical feathers and then accented with the eyes to see into the Tomorrow. 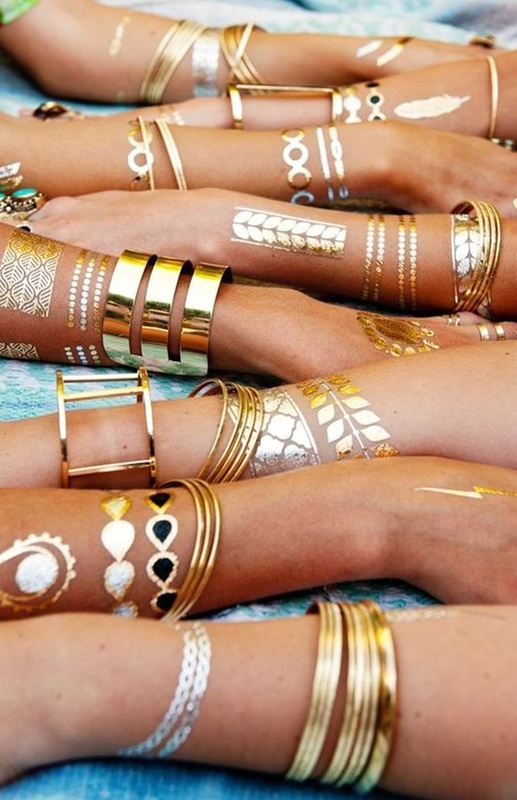 The use of golden and silver Metallic to give arm Charm bracelets with the Infinity sign just below the elbow. 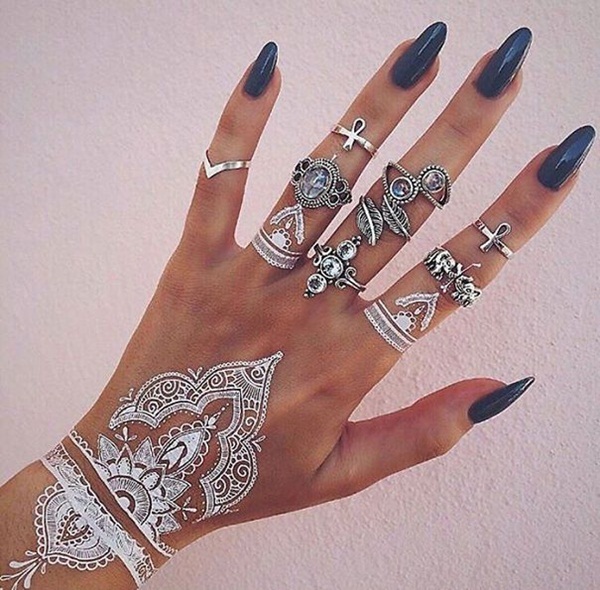 Along with fingers and rings make up this beautiful body! 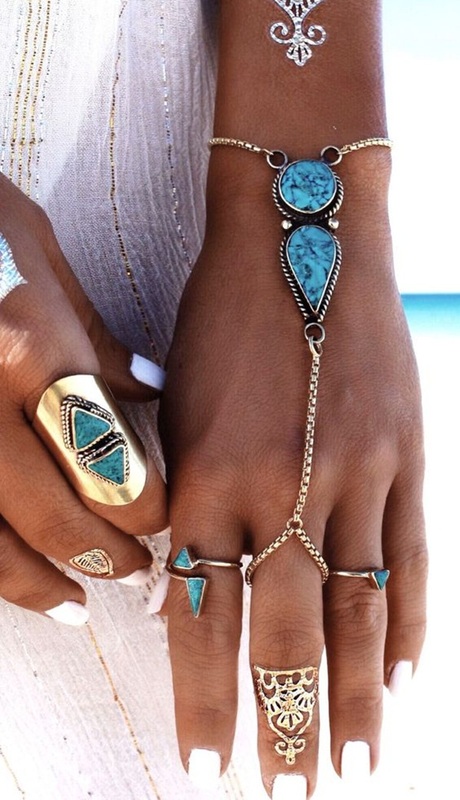 Done in Blue and Gold just a touch of great beauty with the ring that is pure perfection in Metallic tattoo designed just for your finger. 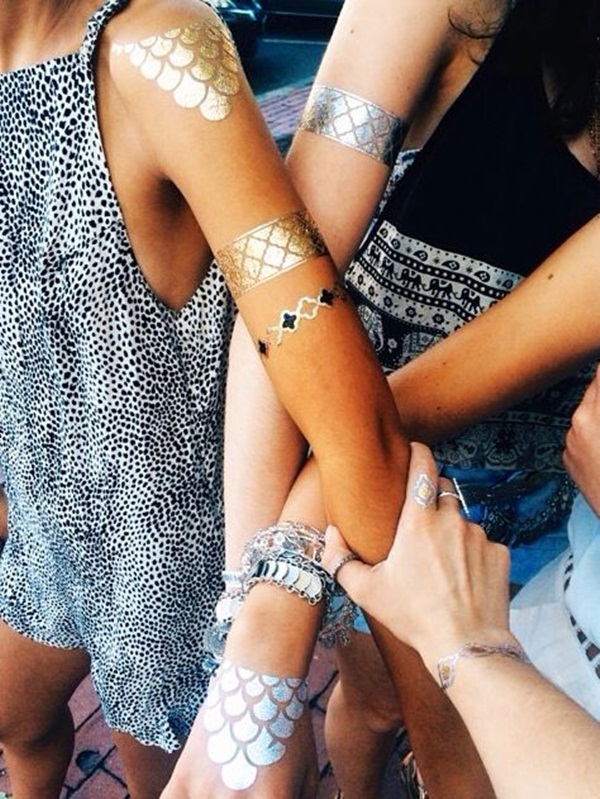 Enjoy the beauty of the Gold, Silver, and black hues of your Metallic Tattoos as the evening sunsets. Done on the hands and arms for charm and beauty the flowers and leaves are all part of the Metallic Tattoo perfection. 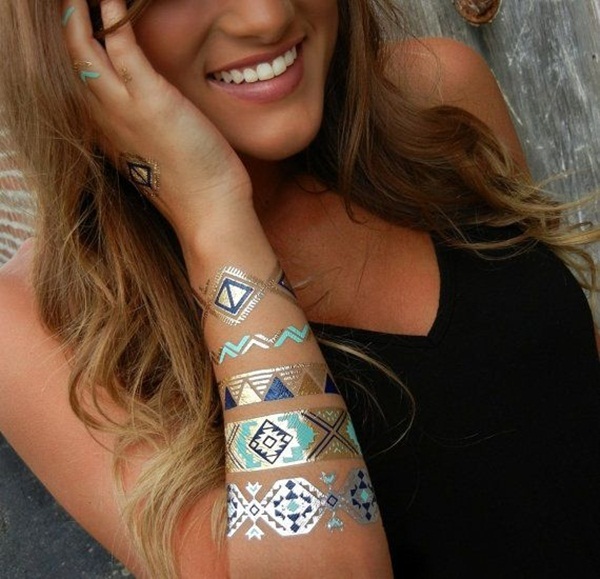 Different Designer Bracelets from the hand to the elbow done in blue on gold make this one of the most outstanding tattoos. 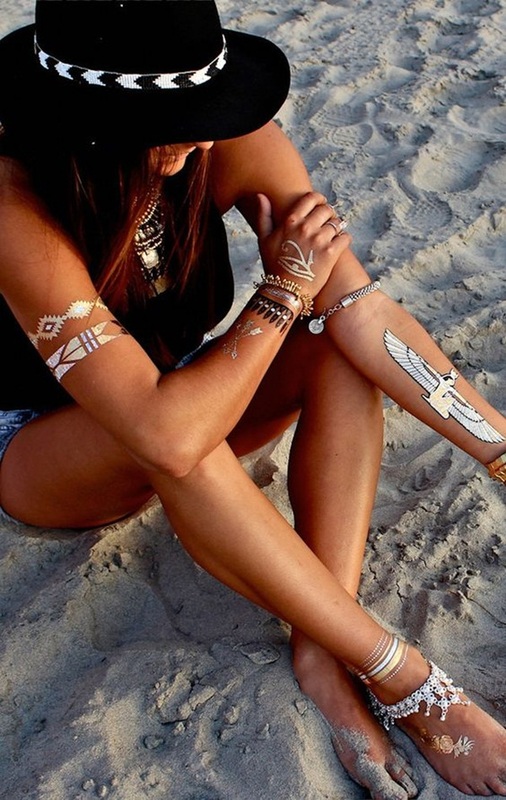 From the Native Indian on the Chest to the gorgeous tattoos along the arm. The hand rests with the alligator while at the top of the arm is the ever seeing eye. 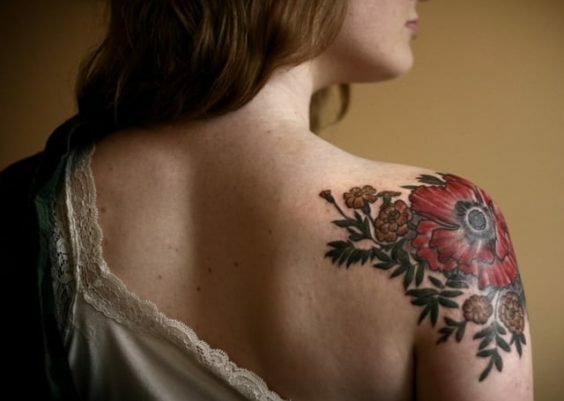 What a beautiful way to accent your arm with this inlaid design going down the arm and ending with the romantic flower. 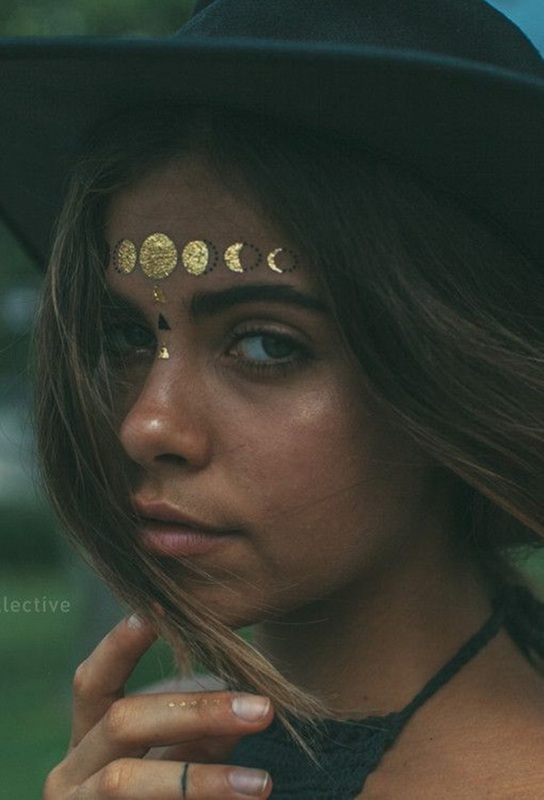 The Arrows and Emblems show the Boldness in you! All across the shoulders to peak down in center a magnificent tattoo. The ascent of real jewelry along with the beauty of the leaves and curving of the necklace gives this the perfect White Metallic Necklace. 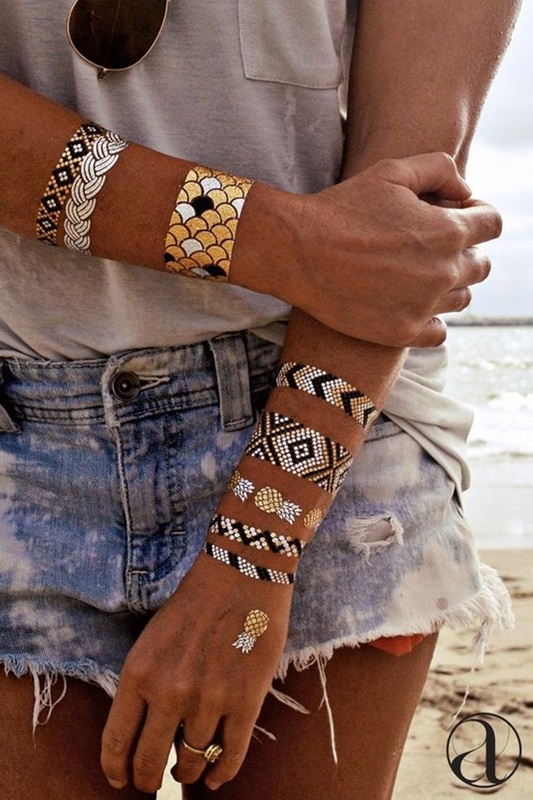 The different designs in Gold and Silver give this gal the Romantic Feel of the South West. 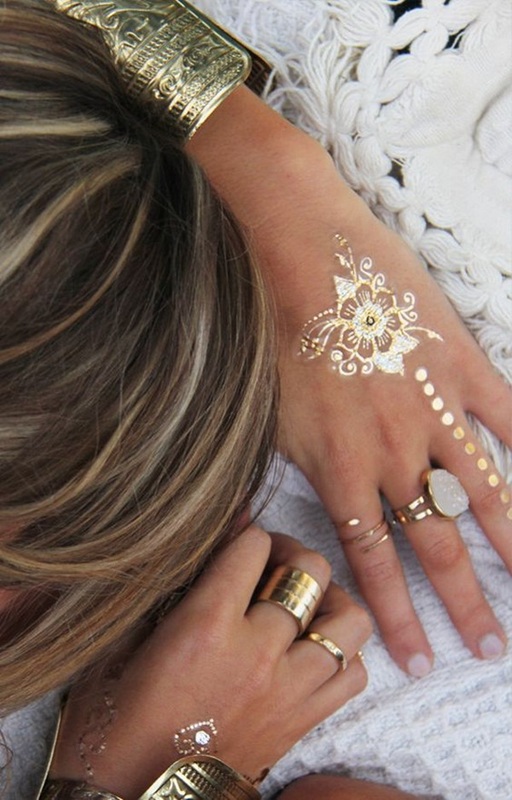 The swirls and circles done in gold and silver give her the feel of real beauty.